Marble floors, although beautiful, can be quite sensitive to chemicals and traffic. Many types of cleaning fluids that are marketed for floor cleaning can actually damage your marble floor. Cleaners containing ammonia, acids, or oils should not be used on marble. Even if you're trying to go green by cleaning with vinegar - Don't use it on your marble floor. The acid can cause etching and destroy the shine on the marble floor. Only use an approved marble floor cleaner on your marble floor or surface. If your floor is already damaged, etched, or lacking luster, you may need to call in a professional marble restoration company. A marble restoration company can return that expensive marble floor to it's former glory with grinding, honing, polishing, cleaning, color enhancing, and sealing the floor. 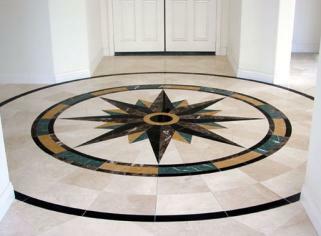 A professional marble restorer has the tools and the know how to bring back the beauty of your marble flooring. I did some searching for you and there are plenty of the basic "hire a contractor, clean up" type checklists, but not many for the supplies you may need and projects to do. There are plenty of books on the subject, however.